Legendary Tasmanian riot grrl noise punks Little Ugly Girls formed in Hobart in the very early 90s, but have never released a record until now. New album Little Ugly Girls is officially their debut album, and features recordings spanning more than 20 years, including new sessions to finish off songs first tracked in the late 90s, which were left stranded on a damaged hard drive for two decades. The band formed around fiery vocalist Linda Johnston, whose high-kicking stage antics make her one of Australia’s most electrifying frontpeople, and her guitar demon brother Dannie “Bean” Johnston. After moving to Melbourne in the mid 90s, the band settled on their classic lineup of Brent “Sloth” Punshon on drums (who also recorded a large part of this album), and rock-solid bassist Mindy Mapp (previously of another cult 90s band, Brisbane’s much-loved Fur). 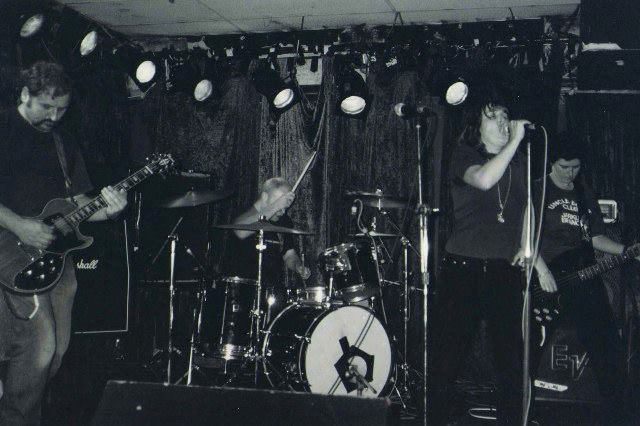 Little Ugly Girls played with the likes of Bikini Kill (after Linda personally organised for them to make a detour to Hobart on their first Australian tour), Fugazi, and once memorably headlined over the White Stripes in Melbourne. But their only recordings released to date include a handful of 90s cassettes (some now archived at the Bandcamp page of Hobart label Goulburn Street Records) and one three track CD-R.
Now nearly 30 years since they formed, the debut album by Little Ugly Girls shows them at their towering best – fierce and inspiring, with Linda’s scarifying lyrics and impassioned delivery set to a huge wall of taut punk noise. It has been a long time coming, but it’s as good as you could have dreamed. Little Ugly Girls is a one-off vinyl pressing of 500 copies, released on Chapter Music on August 3. Pre-order your copy here.